Barcelona are eyeing giving Thiago Alcantara a homecoming as they ponder a €50 million move for the Bayern Munich midfielder. The elder Alcantara brother signed for Bayern at the start of the 2013-14 season and has slowly but surely carved a niche for himself at the German side. He made his debut for Barcelona in 2009 as an 18-year-old and was a useful member of the squad for Pep Guardiola and Tito Vilanova to use. Both of Barcelona’s summer midfield signings, Andre Gomes and Denis Suarez have not really settled in this Barca side and it is disappointing for Luis Enrique that the team is as dependent as it is on the presence of Andres Iniesta. Iniesta is 32 now and it will be foolish to expect him to go on at this rate for too much longer. 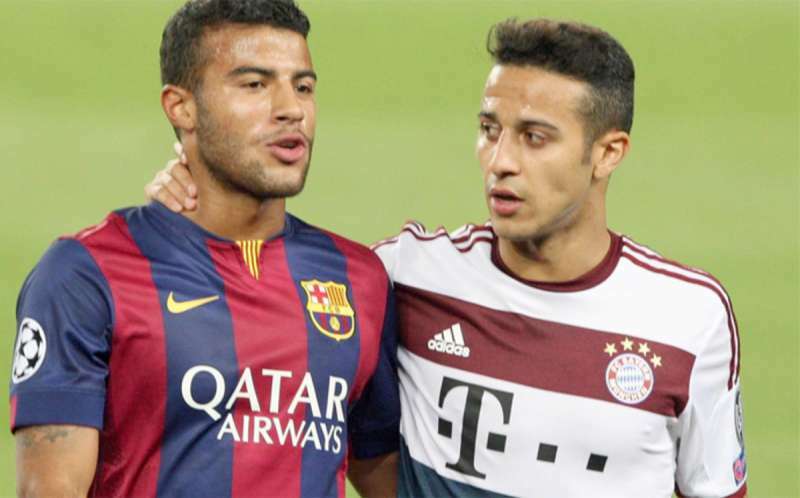 Rafinha, Thiago’s younger brother, has done reasonably well recently, but his better performances have come in the Copa Del Rey and not in the league. For his part, Thiago has been terrific for Bayern this season. His performances in midfield have been the fulcrum on which Bayern’s season has been revived. With Xabi Alonso behind him, Thiago has gone about his creative duties in serene fashion. The 25-year-old has two goals and two assists in Bayern’s last five games – all of which the Bavarians have won. Bayern are currently top of the Bundesliga after a stunning performance gave them a 3-0 win against RB Leipzig in their last game before the winter break. Thiago put on a stellar display in that game, as he dragged his marker all over the pitch and eventually had the Leipzig defenders chasing his shadow. He scored Bayern’s opener in that game and assisted Xabi Alonso’s second, as the giants made a giant statement. Barca, on the other hand, have struggled in the first half of the season. They go into the winter break in second place, three points behind Real Madrid – but Zinedine Zidane’s men have a game in hand. In their current situation, the Catalans would love to have some creativity and spark in midfield and that is exactly what Thiago brings. It will also be a realisation of a dream for his family as both him and his brother have said on more than one occasion that their eventual goal was to play football together at the same club and make each other proud.